After reading Steve’s October 5 blog entry lamenting Christie’s recent Star Trek auction, and after looking at the October 30 article about the auction itself at startrek.com, I was a little depressed. Now it’s happening all over again—to a lesser extent perhaps. Nevertheless, it’s once more unto the breach. 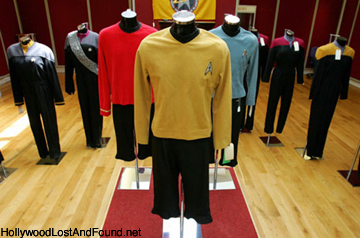 On November 20, 2006, startrek.com announced yet another sale by Paramount of Star Trek props, costumes, and set dressing. The sale is set for December 15 and will be conducted by It’s a Wrap! Production Wardrobe Sales in Burbank, Hollywood, and online at eBay.com. There was a sinking feeling in my stomach that the Christie’s auction from October 5-7 was only the beginning of many more similar auctions. Granted, this kind of thing is nothing new. Studios have been placing items on the block now and again at auction houses and on eBay for years, and I must admit to some conflicted feelings on the subject. Even as such sales represent the loss of an opportunity for many historical Hollywood artifacts finding their way into museums, they do represent an opportunity for individuals to enjoy bits of film history in a way they otherwise would not. In addition, there can be something of a fallacy in thinking that most things sold through such auctions would otherwise make their way to a museum at some point, either as a traveling collection or permanent exhibition. In fact, by placing such items up for auction, the chances of an interested party either buying an item for a museum or later donating an item to a museum may actually increase substantially over the chances of a studio doing the same of their own accord. And that, I think, is where the queasy feeling comes from—knowing that most studios are content to sell pieces of their history to the highest bidder rather than donating or selling them directly to an institution where the public can learn from and enjoy a connection with that history for many years to come. There is certainly nothing inherently wrong with the impulse for a studio to make money in such a fashion. Film studios, after all, are businesses. Making money is what they do. But there is a danger in unloading film history in this way purely for profit; a myopia bordering on the irresponsible, particularly when it comes to artifacts associated with visual effects. Digital effects are already at that point where the only space required for storage exists on a server. As a result, all of the physical models taking up warehouse space, at the very least, become fair game for studios willing to make a quick buck and clear some shelves for future use. Once those models are sold there are no guarantees that the public-at-large will ever have a chance to appreciate their remarkable place in VFX history first hand. Considering that the Trek models raked in the largest returns of all the items sold at auction in October, it is clear that any given studio’s incentive to sell is at least as great as the public interest in such items, and a success like Christie’s Trek auction is bound to attract imitators. And therein lies the problem. As studio ownerships and studio heads turn-over with chronically less and less attachment to a progressively more distant history, it will become easier to question why all of this marketable "stuff" like old miniatures, costumes, props, and set elements from long-standing film favorites is lying around in storage taking up space when it could be sold for a healthy profit, while reducing overhead at the same time. So, what to do? I think Steve hits the nail on the head when he (and Indy) says that there should be a museum for these works. Why nobody has put together, say, a really world class museum of visual and sound effects history makes little sense to me; especially considering a) how much the two work together in concert, and b) considering the broad public interest in effects work since the late seventies, if not earlier. There is The Science Fiction Museum and Hall of Fame in Seattle and, without having actually been there, that museum seems more about science fiction in a broader sense (including VFX) than focusing solely on the history of effects work. That's what I really see as a killer notion; a place filled with visual and sound effects artifacts, but also a place that brings context to the artifacts by way of the personalities behind them-- the Eugen Schüfftans, Ray Harryhausens, Phil Tippets, Greg Jeins and many others contributing to the advancement of visual effects, as well as film sound luminaries like W. K. L. Dickson, Ed Bernd, Ben Burtt, and others. A place that focuses on how effects have been created, how the effects are used (and misused) in film, and how the industry continues to struggle and evolve through the quasi space-race that has erupted in CG software development over the last two decades, as well as the digital revolution in sound work. Above all, what would really be great is to create a place that instills a fundamental sense of wonder and appreciation not so much for "how far things have come" as much as where the imagination, ingenuity, and hard work of people doing effects have taken our own imaginations for many decades now, as well as where that journey may take us in the future. Perhaps this is little more than vain idealism, but I don’t think so. There is value in bringing things like Star Trek's physical history together for all to see rather than scattering that legacy to the winds. The question becomes, how does bringing that history together jump from the realm of idealism into a viable reality?